Synthetic porphyrins have, in the last years, gained increasing interest in analytical chemistry as unique reagents for the detection of metal ions. The porphyrin is a high sensitive chromogenic reagent. Porphyrins and their metal complexes generally exhibit characteristic sharp and intensive absorption bands in visible region. The region from 400 to 500 nm, which is called the Soret band, shows the most intensive absorption, and molar absorptivities about 105 are often found. Soret band (400 - 500 nm) shows the most intensive absorption of these compounds, molar absorptivities often being about 105. The Soret band is widely used for spectrophotometric detection of metalloporphyrins. 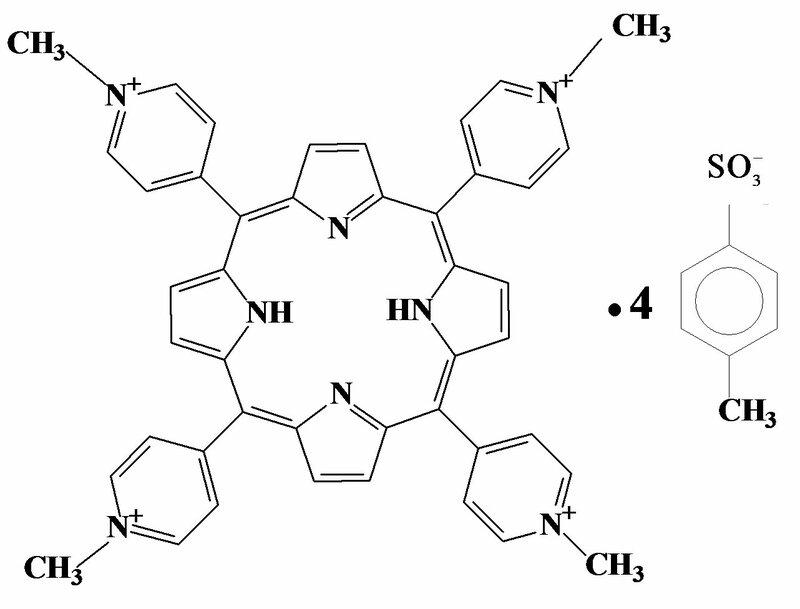 From the perspective of analytical chemistry, the porphyrin ligand has turned out to be very versatile, and almost all metals have been combined with porphyrin. From this point of view several porphyrins become useful as the spectrophotometric reagents for the determination of metal ions. There is sufficient interest towards plasmachemical processes arising at the action of gas discharge plasma at water and electrolyte solutions. It is due to prospects of plasma-solution system applications for water purification and sterilization [1-4], surface modification of synthetic and native polymer materials [5-7], synthesis of nanomaterials [8,9]. 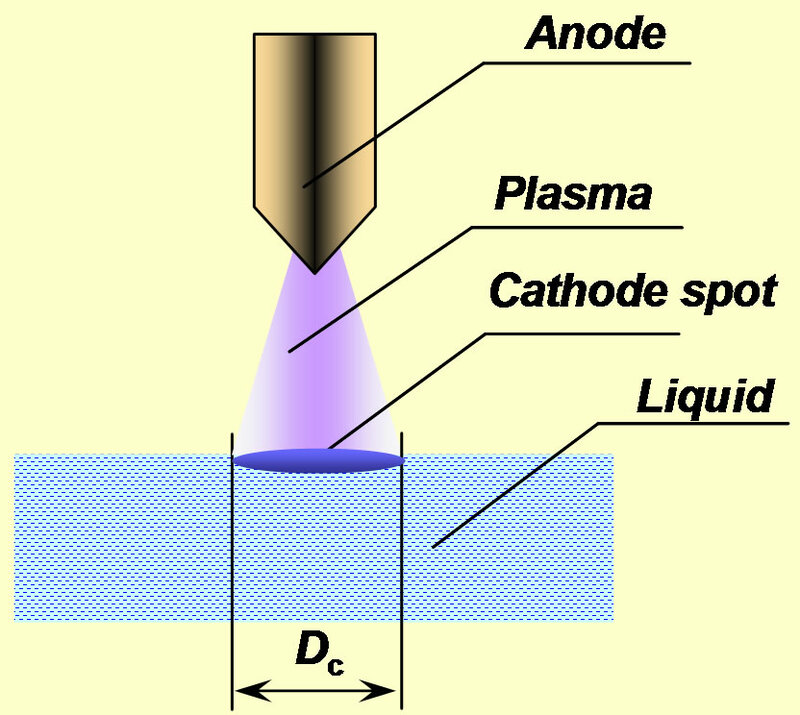 The simplest type of plasma-solution system is that with atmospheric pressure glow discharge with electrolyte cathode (Figure 1). Glow discharge ignition between metal electrode and electrolite surface initiate redox reactions in the solution. The main role in these processes belongs to active particles formed in solution surface layer under the action of ion bombardment (H·, HO∙, esolv) . This layer is very thin (tens of nm), but despite it primary active species have time to react within it. Redox processes in the rest solution volume go with the participation of secondary active species, formed under the interaction of primary active agents with solvent molecules and with each other. Main of them is hydrogen peroxide [10,11]. Н2О2 amount in the system accumulating under glow discharge action is in the dependence of various factors with cathode material among them. There is cathode partial destruction in the course of discharge ignition, Н2О2 decomposition being catalyzed by metal ions [12,13]. 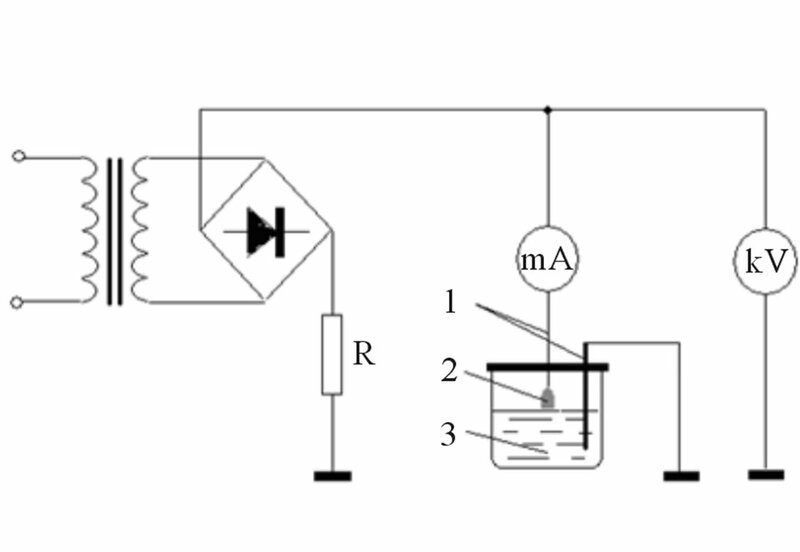 In order to organize effective plasma-solution system, these processes must be taken into account, so as cation concentrations in the solution. Figure 1. The scheme of atmospheric pressure glow discharge with electrolyte cathode. Dc—cathode spot diameter. 1—electrodes; 2—discharge zone; 3—solution under treatment. with the use of synthetic porphyrins as reagents for of Cu2+ and Ni2+ ions. Last years synthetic porphyrins are widely adopted for analytic chemistry methods as unique reagents for the detection of metal cations [14-16]. Indicator reactions of porphyrins with transition metal salts are the base of kinetic method for investigations of structures and properties of salt solvate complexes . Porphyrins form stable coordination compounds with majority of metals (except alkali ones) with formula 1:1 (one ligand per one metal ion). It is important, that porphyrins and their metallocomplexes have typical electronic spectra and ultimate high absorbance factors (ε), they are up to 200,000 in the range of 390 - 420 nm called Soret band . But reactions of metal complex formation are prolonged enough, some orders slower than reactions with another ligands, and there are some difficulties in the detection of metal cations. From the other hand, these reactions may be easily controlled by usual chemical kinetic methods, by spectrophotometry ones, for example. 5, 10, 15, 20-tetrakis(4-methylpyridil)porphyrin in the tetratozilat form (Н2TPyP) was synthesized at boiling heating 10, 15, 20-tetrakis(4-pyridil)porphyrin with methyl ether n-toluenesulphonic acid in nitromethane. Following bands were found in absorbance electronic spectrum of Н2TPyP with lmax, nm (ε l/mol·cm)): 420 (2.3 × 104), 518 (1.8 × 103), 554, 584 (5.4 × 102), 641. Absorbance electronic spectra (UV-VIS) were obtained by spectrophotometer “Shimadzu UV-180” (Japan). NMR were obtained by spectrometer AVANCE-500, Bruker, Germany. The IR spectra samples in KBr tablets were recorded on a FT-IR spectrophotometer Avatar 360 FT-IR ESP (“Thermo Nicolet”, USA) in the frequency range of 400 - 4000 cm−1 at room temperature. The structure of synthesized Н2TPyP was confirmed by UV-VIS, IR and NMR investigations in deuterated water [19,20]. The study of Н2TPyP complex formation with copper salts in water solutions was carried out by methods of spectrophotometry in temperature-controlled cells in the range of 278.15 - 298.15 K. Temperature fluctuations were not more than ±0.02 K. The application of this method is possible due to considerable differences in absorbance spectra of porphyrins and their metallocomplexes. Temperature-controlled solutions of porphyrin and copper nitrate (with 10 - 100 excess) were mixed in the cell, absorbance being measured in fixed time intervals at wave lengths with most optical density alterations. Gas discharge treatment was organized as follows. The cell of glass had the volume of 100 ml. Anode in gas phase and cathode in the solution (Figure 1) were of copper (or nickel) wire with the diameter 2 mm. Distilled water was used as electrolyte. Discharge current was 10 mA, interelectrode gap—2 mm, discharge treatment time —0.25 - 4 hours. There is pH decreasing take place in liquid phase under glow discharge action, so after its completion solutions were neutralized by NaOH up to pH 6. pH values in the interval 3 - 8 were controlled by portable pH—meter рН-009(1). The application of porphyrins as high sensitive agents for metal cations detection is limited by insolubility of most porphyrins and their metallocomplexes in water. This problem may be solved in part by the use of amphiphilic porphyrins. The presence of polar groups in these compounds allows to increase their solubility in aqueous media, and high solvation index of transition state brings in whole to the acceleration of the reaction of complex formation with metal salts . To estimate Cu(II) and Ni(II) concentrations in aqueous solutions after glow discharge action Н2TPyP was used in the form of tetratozilat. The disposition of these compounds towards association is important factor of influence on the reactivity of water soluble porphyrins. In weak acid and alkali aqueous solutions porphyrins of cation type may exist as equilibrium mixture of monomer and associated forms . The study of Н2TPyP electronic spectra in the range of concentrations 5 × 10−7 - 2 × 10−4 mol/l in aqueous and in aqueous-buffer solutions at рН = 3.5 - 8.0 showed the absence of location shifts of absorbance bands. Alternations of band intensities at solution dilution are in the conformance with Lambert law, values of molar absorbance factors being by this correspondingly constant. 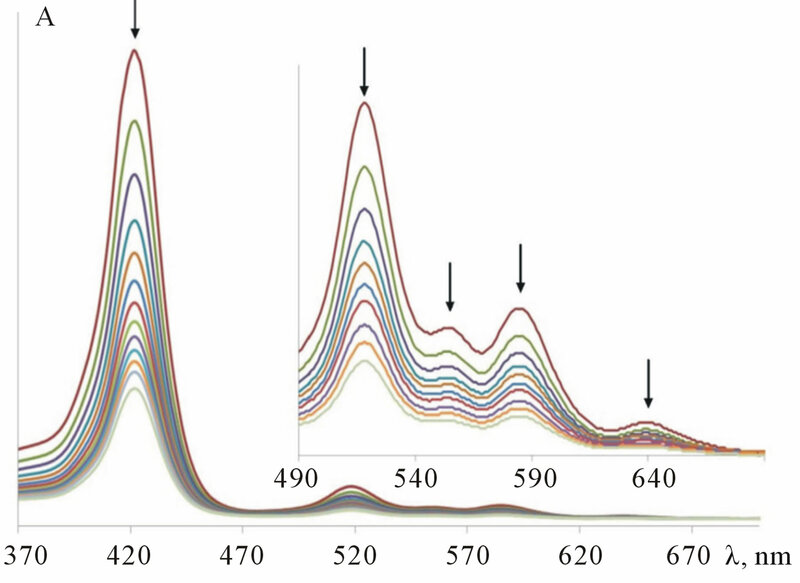 Typical examples of spectra changes at the dilution of aqueous Н2TPyP solutions are presented in (Figure 2). Data presented is the evidence of monomer form of Н2TPyP existing in aqueous solutions. Figure 2. UV-VIS spectra of Н2TPyP in water solution at diluting. nitrate in aqueous solutions (1) at рН = 6.0. 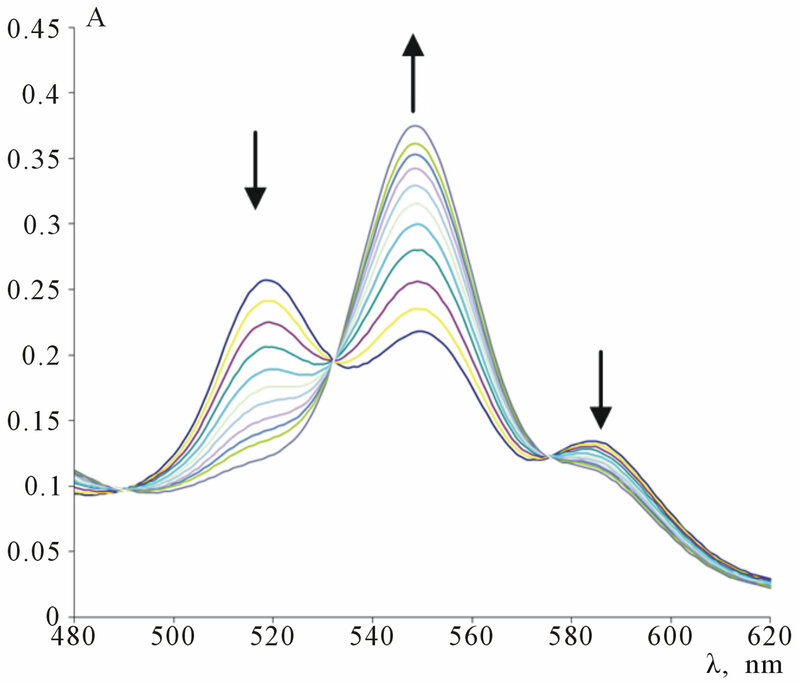 The process of metalloporphyrin formation is submitted to kinetic eq.2, distinct isosbestic points being observed in spectra of systems under reactions (Figure 3). where CuTPyP—copper porphyrin complex, k—reaction rate constant. where: t—the time from reaction start, A0, At, A¥—the absorbance of solution at start time, in t time point and at the finish of the reaction, respectively. The data obtained and values of activation energy of reactions of copper complex formation at constant pH and solution ionic strength are presented in (Table 1). To determine kinetic order of the reaction re metal salt in aqueous solutions the dependence of CuTPyP formation rate from copper nitrate concentration (Figure 4). The diagram shows reaction order re salt to be 1. Rate constants of second order were calculated by Eq.5. Figure 3. 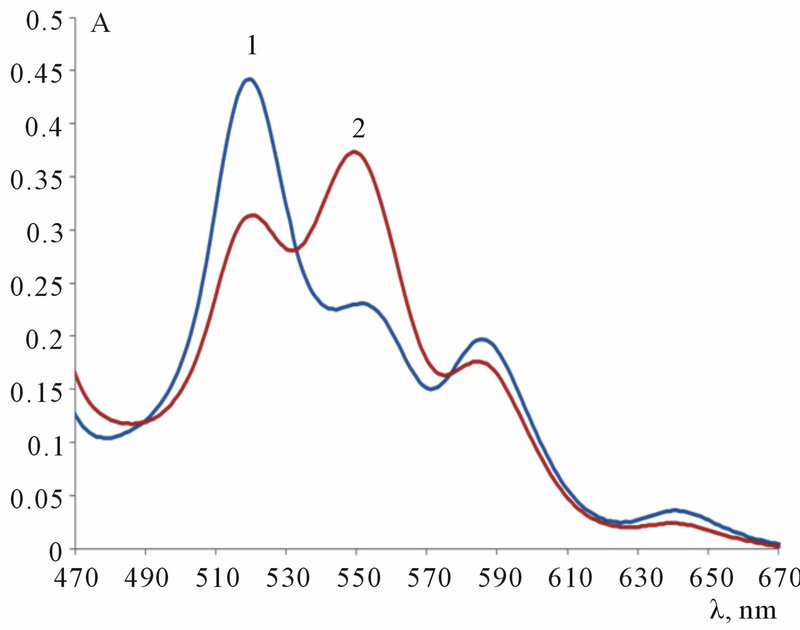 UV-VIS spectra of Н2TPyP-Cu(NO3)2 system in aqueous solution. Figure 4. The dependence of –lgkef from –lgсCu(NO3)2 of CuTPyP formation reaction at 298,15 K in water-buffer solution at pH = 6. Table 1. 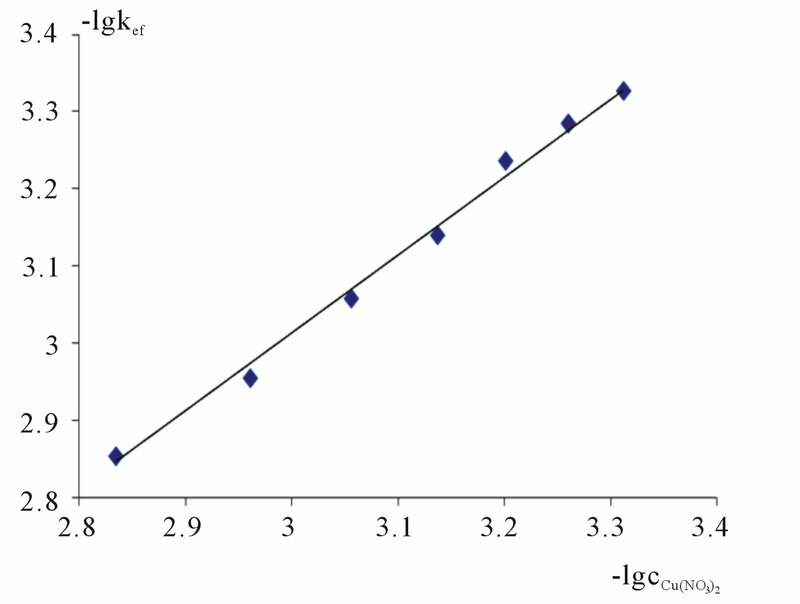 Kinetic parameters of the reaction of Н2P coordination by copper nitrate in water-buffer solution with pH = 6 (l— analysis wavelength, cСu(NO3)2 = 2.5 × 10−3 mol/l). Figure 5. UV-VIS spectra of Н2TPyP (1) and formation of CuTPyP (2). in the spectrum (Figure 5). 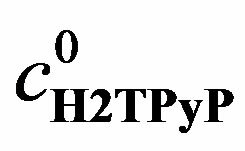 At the excess of Н2TPyP the amount of the ligand off the reaction was determined. Thus, Cu2+ concentration in the solution after 120 minute discharge action was 3.24 × 10−4 mol/l. The method presented has some limitations: metal concentrations lower than ~10−6 mol/l can’t be detected. However, we can assert that at the experiment with the use of Ni cathode nickel cation concentration in the solution was not more than ~10−6 mol/l even at long discharge treatment (more than 5 hours), because there was not changes in the spectrum of Н2TPyP by the add of the solution after discharge treatment. Possibility in principle of amphyphilic porphyrins application as sensitive reagents for the detection of metal ions passing from electrodes into electrolyte solution at gas discharge action was shown in present work. 5, 10, 15, 20-tetrakis(4-methylpyridil) porphyrin in the tetratozilat form was found to be not associated in aqueous media in wide pH range, hence, macroheterocycle reaction center is free for complex formation of metal ions, and this makes it sensitive to the presence of metal cation in a solution even at concentration about 10−6 mol/l. The work is supported by RFBR grant No. 10-03-00305-a. Moisan, M., Barbeau, J., Moreau, S., Pelletier, J., Tabrizian, M. and Yahia, L.H. (2001) Low-temperature sterilization using gas plasmas: A review of the experiments and an analysis of the inactivation mechanisms. International Journal of Pharmaceutics, 226, 1-21. doi:10.1016/S0378-5173(01)00752-9. Zakharov, A.G., Maximov, A.I. and Titova, Yu.V. (2007) Physicochemical properties of plasma-solution systems and prospects for their use in technology. Russian Chemical Review, 76, 235-251. doi:10.1070/RC2007v076n03ABEH003638. Berezin, B.D. (1981) Coordination compounds of porphyrins and phthalocyanines. John Wiley, Toronto. Smith, K.M. (1975) Porphyrins and metalloporphyrins. Elsevier Science, Amsterdam. Hambright, P. (2009) Chemistry of water soluble porphyrins. In: Kadish, K., Smith, K. and Guilard, R., Eds., The Porphyrin Handbook, Elsevier, Academic Press, 3, 132-208.